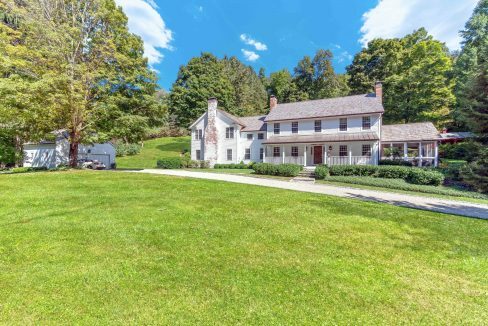 Striking architectural estate privately situated on nearly 8 pastoral acres edged by stone walls and a whispering brook on one of Washington’s most coveted roads. 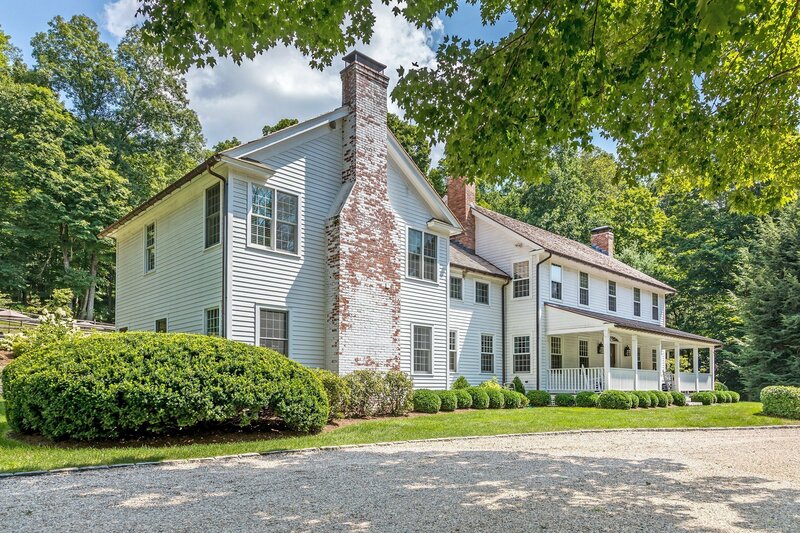 Set back on a graveled circular driveway, the 2-story clapboard colonial with covered porch invites you to stay the moment you arrive. Experience an exceptional floor plan that flows seamlessly from a grand entry foyer/art gallery into the comfy fireplace-fitted sitting room with built-in bookcases that leads to a spacious party-ready living room — perfect for large groups — with dramatic high-beamed ceilings, second wood-burning fireplace and multiple French doors opening to the flagstone patio with marble stairs leading beyond to the upper patio with heated Gunite pool. The spacious Chef’s dream kitchen sports 2-inch white marble countertops, stainless bib sink, designer appliances with Sub Zero and Miele, and a 6-burner chef’s gas stove with duel ovens. There’s also a breakfast area with bay window offering views of the grounds, a center island that comfortably seats four, and an adjacent summer lounge/sunroom/sanctuary with screened bluestone porch, fireplace and TV — perfect for winding down any time of year. Contiguous to both the kitchen and sunroom is a large formal dining room that can accommodate twelve or more guests, and features a fourth fireplace. A wide center staircase ushers you to the delicious master suite with fifth fireplace, two dressing rooms, separate office/sitting or nursery room, and laundry. The master bath with treetop views has a walk-in shower, standalone tub, and double vanity. Three guest bedrooms are all zoned separately and include one ensuite, and two sharing a third full bath recently updated with tub shower. The gorgeous 7+-acre property invites you to relax and appreciate the sights and sounds of the immersive landscape. 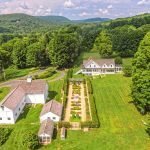 Among mature oaks and evergreens, flowering perennials and specimen gardens is a flagstone loggia and grilling platform for entertaining and al fresco dining, a gorgeous rolling lawn for playing ball and sunning, a flagstone-wrapped heated Gunite pool, small barn, seasonal brook, and waterfall. Other highlights: 1,400-sqft full-height basement, 2-car detached garage with loft. Throughout the home: oak, pine and antique wide-board flooring, Lutron lighting system, smart WiFi-zoned heating, storm windows and doors. Recent updates: a brand new cedar shake shingled roof with copper gutters, freshly painted exterior clapboard, pea-stone gravel drive. A move-in-ready home that exemplifies the personality and taste of those accustomed to the best in quality, design, finishes and lifestyle. A rare opportunity in this market. Come visit. You will be transformed. 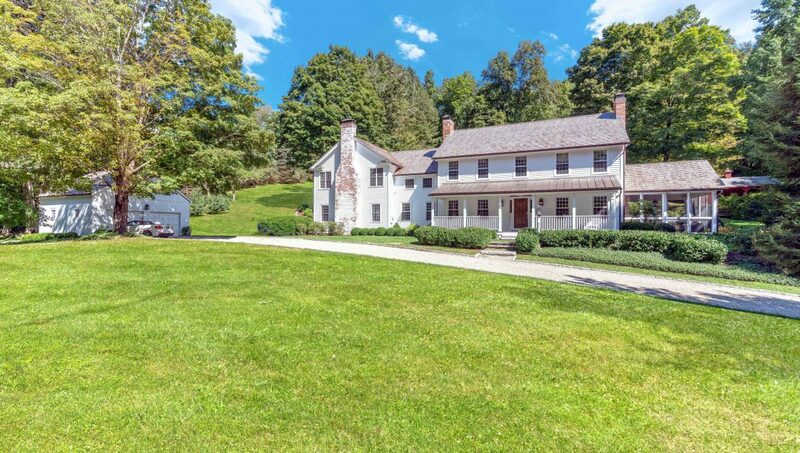 Located 90 minutes from NYC, minutes to Mayflower Grace Inn, Lake Waramaug, historic town of Washington, Washington town beach and the shopping village of New Preston. To request an information packet or to arrange a personalized tour of the home and property, please email Mark Madonna or Jeffrey Phillips at mp@wpsir.com or call/text 860.800.3344. Living in Washington presents the best of both worlds – a small town lifestyle with a rich and vibrant cultural scene. With a population around 4,000, the community is tight-knit and welcoming. Being just a two-hour drive from New York City, Washington has historically attracted summer residents seeking a scenic retreat from city life, as well as those yearning for a laid-back lifestyle. The area’s panoramic scenery, preserved farms and forests, and historic village architecture make for breathtaking surroundings. And the town’s abundant culture, folksy community events, vibrant business community, and wonderful schools make for an unparalleled lifestyle. Discover more about Washington here. Listing information is deemed reliable, but not guaranteed. No photo or description reuse without expressed written permission. Descriptions are subject to errors, omissions, unannounced price changes and/or availability. Care has been taken in preparing descriptions, but no warranty is intended or implied. Customers must satisfy themselves as to the correctness of all statements.